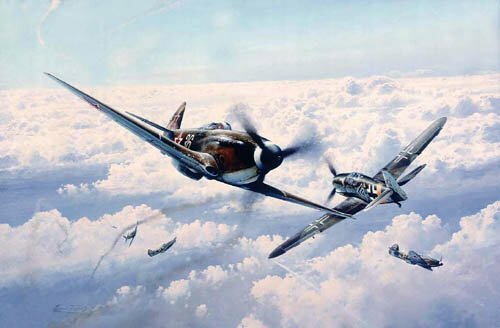 The penultimate Limited Edition in Robert Taylor's Protagonists Series, featuring the Russian Yak 3 in combat with Messerschmitt Me109s on the Russian Front. A Soviet Yak 3 hurtles towards us in a typically daring head-on attack on a Bf109. Other Yaks wheel and turn frantically in search of the enemy. Casualties on both sides are evident. Away into the distant horizon stretches a vast Russian sky, painted in Robert’s inimitable style: soon all will be quiet again until the next ferocious encounter. Overall print size: 33" x 24"
Each print is individually signed by SIX fighter Aces of the Russian Front having flown between them over 3316 missions, achieving 547 air victories. Joining two top Russian Aces, both heroes of the Soviet Union, and two leading Luftwaffe Aces, are two highly decorated fighter Aces from the legendary Free French Normandie-Niemen Squadron.